Did you spot it? Actually, all eight ducklings were in the lily pads, with Honey looking on from outside, but all I could see was the pads rustling. For a brief instant I got a glimpse of this little one (circled; click on screenshot to enlarge). This entry was written by whyevolutionistrue and posted on June 24, 2018 at 3:00 pm and filed under Uncategorized. Bookmark the permalink. Follow any comments here with the RSS feed for this post. Both comments and trackbacks are currently closed. I wonder if they’re hiding from a predator, or they’ve just found a new place where there’s food? Wow. I actually got it. Me, too! ‘Twas the only spot in the pic that looked to have duckling colors to me. That’s right at 1150, 1600 like I said, but I still can’t figure out what duckling part it is that we’re seeing. 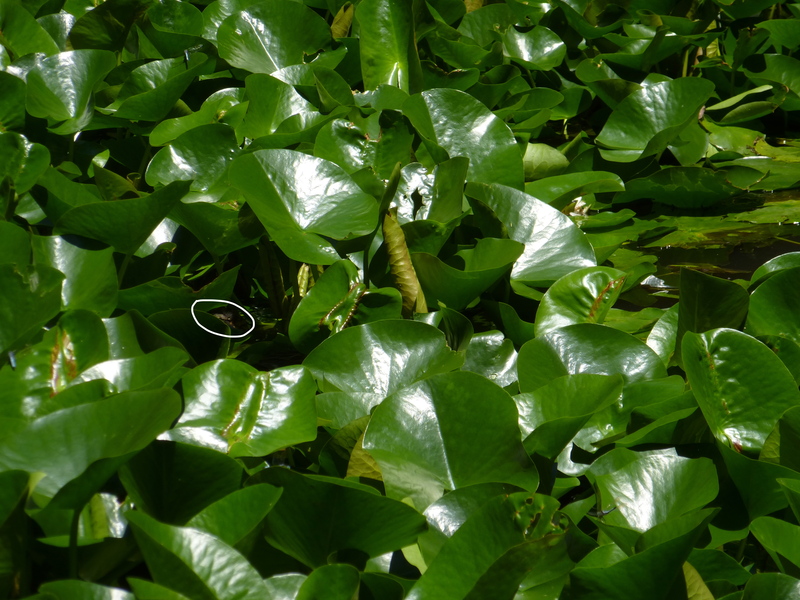 How about “spot the dragonfly” (or is it a damselfly? There’s one near the top slightly left of vertically above the duckling and another on the left edge of the picture slightly below the level of the duckling.